Today I started a project that I have been thinking about for years. It's a daunting task and I'm putting myself on the line by mentioning it here. I'm going to write a "how to paint acrylics" book for beginners, based on the workshops that I've been teaching for many years. I have 5 pages already and plan to chip away at it every day until I'm finished. All the info is in my head- the challenge will be putting in the hours to get it down on paper. 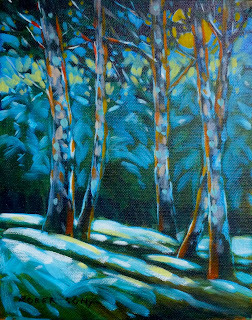 Here's little wintery painting that I did for the "Spirit of Winter" show currently hanging at the Adele Campbell Gallery at Whistler. The evolution of this painting was a bit unusual for me. I had painted it in early fall- mostly in green as it was done plien air in the daytime. I liked the composition but didn't consider the painting to be strong enough to go to one of my galleries. I needed a couple of small pieces for the AC gallery show so I decided to try to make it a winter scene at night time. I think it works much better this way and it was fun to experiment with no reference photo to go by. Here I am with Rino last week at the "Art for an Oil Free Coast" show at Performance Works on Granville Island. We opened November 27th, with a full house of 300+ people. An army of volunteers made this show possible and I would like to thank all that gave generously of their time and energy. The show was taken down last Sunday and re-opened in Victoria on Dec 4th. Next destination is Salt Spring Island, then Nanaimo. Details on the shows, the book and online bidding on the paintings can be found at Raincoast.org. It was a privilege to be a part of this very ambitious project. If you get the chance to see the show, I highly recommend it- 60 paintings of our beautiful BC coast by some of the province's top artists. 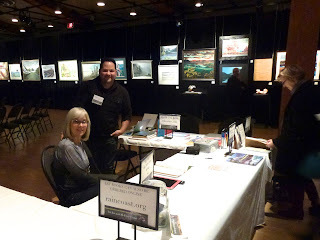 Last night Alan and I went to the opening of another amazing show- the annual Spillsbury Medal show at the Federation of Canadian Artists in Vancouver. I think this is the strongest and quite possibly the biggest medal show that I have every seen at the FCA- 93 paintings all told. The show can be seen on line at www.artists.ca.